We are announcing a new feature to better serve you so you can deliver the latest, most useful information to your audience! 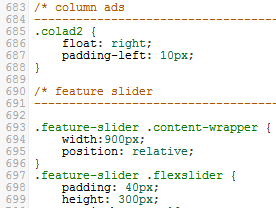 Our newest update is on our CSS Editor. We have added a new in-browser CSS editor to improve your CSS editing experience. Another must-have for any coder out there. Syntax highlighting helps you identify the components of your code. Any coder also knows that you almost can't live without line numbers to help you keep track of your spot. A powerful feature available in any geeks code editor. Now you can search your entire CSS file for occurrences of any query you may have. With Search and Replace you can quickly swap out one color for another every place it occurs in your code. Need to see more of your code at once? The code editor window can be moved, resized, and even full screened so you have all the room to work that you could possibly need. Properly formatted code is the key to scanning and finding what you're looking for. Simply highlight the code you want to format and press the button. The auto-formatting feature keeps your CSS code nicely formatted, while removing the burden of having to format manually. If you are working on your website design in CSS and need to preview a few small edits you have made, use the "Save" button to keep the editor open for further revisions. Or, if you are finished with your changes, use "Save and Close" to close the editor and move on to your next task.